In case you haven’t seen this article, you should check it out. A young girl, only 14 years old, is trying to run a marathon on every continent before the age of 15. Why tackle this crazy task you may ask? She is doing it for her father who died of prostate cancer. Winter Vinecki is seeking to match every pink ribbon with a blue ribbon and so far she has raised over $400,000. That’s quite an accomplishment for young girl from rural Michigan. Many have told me I’m too young to run these distances, to wait until I’m older. My dad waited until he was 40 years old to do the things he wanted to do and never got to do them. I’m more than capable now to do the things I do, so why put them off until tomorrow? What amazing things are you going to do today? I’m currently reading Chrissie Wellington’s book, A Life Without Limits. According to my Kindle, I’m 26% completed. So far I’d say, it’s a compelling book. Before I even really knew who Chrissie Wellington was, I already liked her. Who can not love that smile? It’s quite contagious. We would arrive back exhausted, sweaty and hungry, but with spirits soaring. We had no idea how far we had been, how many calories we’d burned, what heart rate we’d maxed out at. There was no data to download or logbook to tick. This was raw and elemental, the way sport and adventure has always been. I’m sure it was the making of me. Raw and elemental. Sometimes I feel we overcomplicate things. Gadgets have their place and so does pure, simple, adventurous running. When I get back to running, I plan to have a weekly running “project” of something adventurous. Yesterday I was fortunate enough to watch the running portion of the Kona Ironman World Championships. What I thought would be just a few minutes, turned into hours of watching the most amazing athletes ever. And what impressed me more than their amazing athletic accomplishment was the fact that they are all so humble and nice to one another. Those athletes are truly a special group of people. Just how amazing and incredibly fit are these triathletes? I don’t know much about swimming or biking but I do know a thing or two about running. I looked into the times for the marathon portion of the race yesterday. The fastest run time was 2:47:23 by Andreas Raelert (2nd place finisher). That averages out to a 6:23 mile for 26.2 miles. I’m pretty sure I could quit my job, hire the best running coach around, and still not be able to achieve that time. And forget adding a 2.4 mile swim and a 112 mile bike ride. 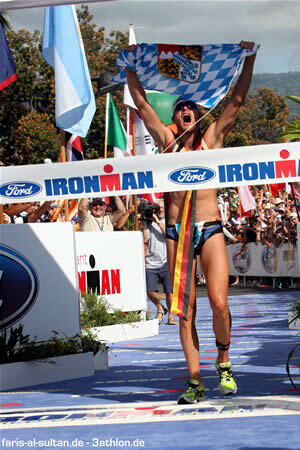 Yes, an Ironman is a lifelong goal of mine. I just can’t get over how fast these people are! Wow, that’s about all I can say. Many many congratulations to all of the athletes in yesterday’s race. Any for a little triathlon humor, PLEASE PLEASE watch this video. It is soooo funny! Thanks Jenny for sharing this!! First of all, happy Wednesday! Wednesday is my favorite day of the week: work hard for two days, an easy day, and then work hard for two more days followed by my favorite Saturday activity – the long run. Even my students look forward to Wednesdays because it’s our motivational day.